Huge Savings Item! Free Shipping Included! Save 11% on the Carolyn Pollack Genuine .925 Sterling Silver Statement Necklace by Carolyn Pollack at Femi Store. MPN: CP5-4483-183. Hurry! Limited time offer. Offer valid only while supplies last. If you're looking for a statement, you've come to the right place. This necklace features loops of sterling silver rope design and signature swirls. If you're looking for a statement, you've come to the right place. This necklace features loops of sterling silver rope design and signature swirls. Wear alone for a fabulous look or step it up by adding your favorite enhancer to the bottom loop or charms made for the necklace. 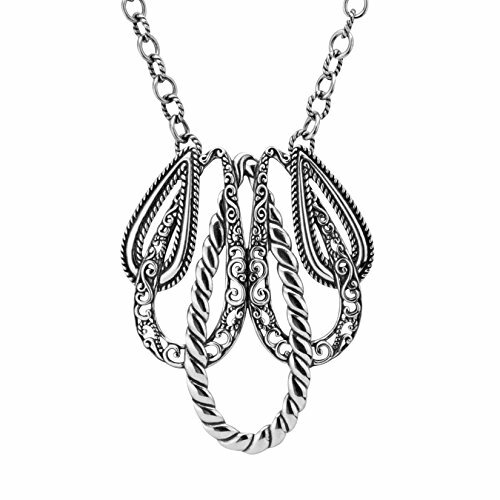 This necklace features loops of sterling silver rope design and signature swirls.